Product prices and availability are accurate as of 2019-01-21 18:53:15 GMT and are subject to change. Any price and availability information displayed on http://www.amazon.com/ at the time of purchase will apply to the purchase of this product. Get ready for the warm outdoors and save with this CombiPak bundle! Consists of both The Honest Business Mineral Based Sun block SPF 50 (3.0 oz) and The Honest Business Organic Insect repellent (4.0 oz). The Honest Business mineral based sun block is created with shea butter and coconut oil to help keep skin sensation soft and hydrated without leaving a heavy residue. Non-nano Zinc Oxide is the only active sun block ingredient. 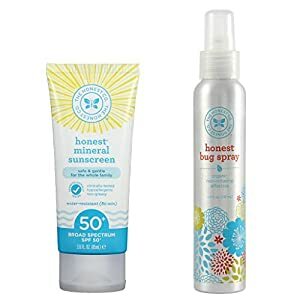 The Honest Business Organic Insect repellent is created with pure, natural necessary oils to securely fend off bugs without hazardous chemicals or synthetic pesticides. The pleasant scent of Rosemary, Citronella and Wintergreen naturally prevent annoying bugs. Packaged in a tough, lightweight and quickly recyclable aluminium bottle.